Neuroendocrinology, Volume II, is the second in a two-volume treatise designed to provide a survey of all aspects of the rapidly expanding science of neuroendocrinology. Only in recent years have the relations between the nervous system and the endocrine system come under intensive scrutiny, but their interactions have already been shown to be multiple and diverse. This diversity is reflected in the range of subjects covered. 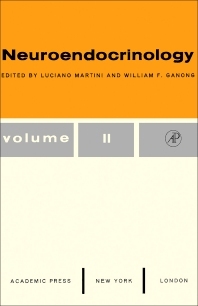 There are chapters on neural control of endocrine function; the effects of hormones on the brain; brain-endocrine interrelations during various phases of development; and the comparative aspects of neuroendocrine integration. The relation of brain chemistry to endocrine function, the effect of drugs on neuroendocrine mechanisms, and the new discipline of clinical neuroendocrinology have also been considered. Not only neurophysiologists and endocrinologists, but pharmacologists, zoologists, biochemists, psychologists, and those in clinical medicine will find the treatise of interest. Parts of neuroendocrinology have been discussed in other works, but this is the first treatise in which an attempt has been made to cover all ramifications of neuroendocrinology. This book can be used both as a text for advanced students and as a reference source.